Are you getting the recommended 7-9 hours of sleep a night? That's a third of your life! At your Mattress By Appointment® Gloucester, MA location, we carry the entirely NEW 2017 line of Sealy® mattresses, and only at Mattress By Appointment® can we typically save you 50-80% off retail pricing! We also have countless financing options, including our No Credit Needed flexible financing and our $40 Down promotion which takes home a mattress today. With offers and savings like that, we make effortless easy to get your quality Sealy® mattress at an affordable price! Founded in 1881, Sealy® has become one of the most trusted mattress brands in the world - and it's not at all surprising! 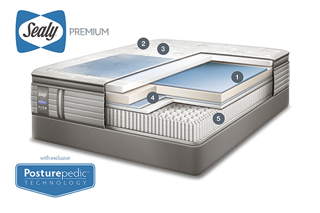 With their exclusive Posturepedic™ Technology, Sealy® is synonymous with comfort, support, and durability. Sealy's Posturepedic™ technology reinforces the center of each mattress to support your back and core, assisting with weight distribution for genuine support from your head to your toes. Crafted in the USA and rigorously tested beyond industry standards, your mattress is sure to last for years to come. With three collections to choose from, finding the right Sealy® mattress for you is practically guaranteed! With three distinct lines in each new collection, including the Sealy® Response™ Line for the traditional feel of an innerspring system with the "sleep-on-top-feeling"; the Sealy® Conform™ Line constructed with a variety of high-quality foams for a luxurious level of "body-hugging" support; and the Sealy® Hybrid Line which pairs the quick responsiveness of coils with the conforming support of memory foam, whatever your choice, we have it here at Mattress By Appointment® - And all collections within each line are built with Sealy's exclusive Posturepedic™ Technology! 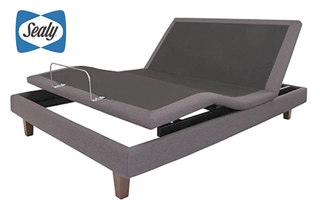 Contact your Mattress By Appointment® Gloucester, MA location, today to "Feel the Sealy® Difference for Yourself!"